Albums of the month for May! I have just spent the day in bed feeling rather rotten but am hoping tomorrow I will feel well enough to crawl into work and answer phones for 8 hours (not easy to do with a massive head cold and a whole load of mucus, too much info, sorry). 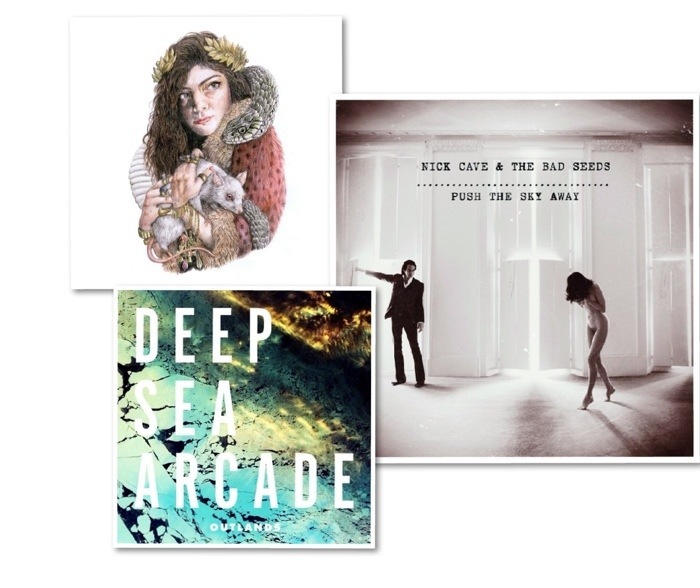 However I thought I would drag myself away from watching back to back Amazing Race episodes (reality tv is my drug, it could be worse) to bring you 3 albums from snother good music month with some cool new additions to the music scene. A short 5 song album from this stunning 16 year old Aucklander! I would be jealous if I wasn’t so overwhelmed by her rather special take on indie-pop that has launched her as an international sensation (the things I was doing when I was 16 were no where near as interesting, in fact not much has changed HA). It’s rather hard to believe the voice and talent of these 5 songs has been written and performed by such a young newcomer to the music world, in fact it leaves you kind of dumb struck. All 5 songs on the EP have something unique to offer but my favorites would have to be Bravado and The Love Club. My next favorite of the months was this great LP by a relatively new Australian band which was featured on 95bfm and one song left me wanting more (in a good way). The album is a pretty varied mix of british indie/brit pop, pychodelic 60s rock and new wave (think a modern version of the monkees…) with other influences that seem to still be being sorted through and organized as I suppose would be common for most LPs. I feel like this album still has a characteristic Australian indie rock feel to it that I associate with other great Australian bands like The Shins. There is a great mix of quiet, thoughtful synth tunes and more upbeat rock tracks yet the album as a whole is a great listen and a new favorite for long car rides (especially as the Husband likes it too, our musical tastes don’t always overlap!). A few of my favorite tracks include Seen No Right, Granite City, Steam and Ride. My absolute favorite of the month was this melancholic, subdued stunner of an album from Nick Cave and the Bad Seeds. I should preface anything further by saying that I have never listened to anything else by Nick Cave other than a song he did with Kylie Minogue once upon a time (thanks to singstar 90s) so I have no idea what any of his previous albums are like. Having said that this is one of my favorite albums of the year, maybe even the last five years or decade. I heard the last song on the album played on 95bfm (the best Auckland radio station in my opinion) and was hooked by its sombre simplicity and yet a hauting emotional intensity that really characterizes every song on the album. Every time I listen to this album I hear and feel brand new things. It’s a creative masterpiece that can come across as simple or laid back but is layered with so much complexity and feeling that I don’t even know where to begin. There are also some rather weird lyrics (Hannah Montanna and the African Savannah come up once or twice…) but I kind of like that, especially as they are being sung in Cave’s amazing baritone that reminds me of classic Leonard Cohen, just a bit stranger and more intense. The songs I can’t get enough of are Jubilee Street, Higgs Boson Street (a weird but wonderful song) and Push the Sky Away, which started this whole love affair. See you soon with some more favorites!